SCOTWISE: DAILY ENCOURAGEMENT – WEDNESDAY WARRIOR. #31…The Risen Christ - Smith Wigglesworth. DAILY ENCOURAGEMENT – WEDNESDAY WARRIOR. 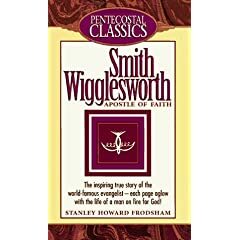 #31…The Risen Christ - Smith Wigglesworth. It was winter time, and I said to the parents, "Will you get the boy's suit and bring it here?" They would not listen to the request, for they were expecting the boy to die. But I had gone to that place believing God. In Romans 4:17, we read of Abraham, "(I have made thee a father of many nations,) before him whom he believed, even God, who quickeneth the dead, and calleth those things which be not as though they were." God help us to understand this. It is time people knew how to shout in faith as they contemplate the eternal power of our God to whom it is nothing to quicken and raise the dead. I come across some who would be giants in the power of God but they have no shout of faith. I find everywhere people who go down even when they are praying simply because they are just breathing sentences without uttering speech, and you cannot get victory that way. You must learn to take the victory and shout in the face of the devil, "It is done!" There is no man who can doubt if he learns to shout. For years we have been longing for God to come forth, and, praise Him, He is coming forth. The tide is rising everywhere. I was in Switzerland not long ago, preaching in many places where the Pentecostal message had not been heard, and today there are nine new Pentecostal assemblies in different places going on blessedly for God. All over the world it is the same, this great Pentecostal work is in motion. You can hardly get to a place now where God is not pouring out His Spirit on hungry hearts. God has promised to pcur out His Spirit upon all flesh, and His promises never fail. Our Christ is risen. His salvation was not a thing done in a corner. Truly He was a man of glory who went to Calvary for us, in order that He might free us from all that would mar and hinder, that He might transform us by His grace, and bring us out from under the power of Satan into the glorious power of God. One touch of our risen Christ will raise the dead. Hallelujah! Dare you take your inheritance from God? Dare you believe God ? Dare you stand on the record of His Word? What is the record? If thou shalt believe thou shalt see the glory of God. You will be sifted as wheat. You will be tried as though some strange thing tried you. You will be put in places where you will have to put your whole trust in God. There is no such thing as anyone being tried beyond what God will allow. There is no temptation that will come, but God will be with you right in the temptation to deliver you, and when you have been tried, He will bring you forth as gold. Every trial is to bring you to a greater position in God. The trial that tries your faith will take you on to the place where you will know that the faith of God will be forthcoming in the next test. No man is able to win any victory save through the power of the risen Christ within him. You will never be able to say, "I did this or that." You will desire to give God the glory for everything. Loving Father, I thank you for the power of pentecost in my life. Teach me in my heart, by the power of the Holy Spirit, what it means to be about my Father's business, especially in the area of availability to my Lord and Saviour! I ask this in the wonderful and mighty Name of Jesus. Amen. SUNDAY SERMON ON THE BLOG – SHARING OUR FAITH. SUNDAY SERMON ON THE BLOG – REAL REFORM!